One thing I’ve loved about doing a cocktail each week has been the discovery of new brands. I won’t deny that my trips to the local liquor store can be sort of mundane…I know the brands I like and have a tendency to use them over and over. I was fortunate to be asked to try a bottle of Atlantico Rum and that tasting, combined with the scent of fall in the air and some fresh pumpkin puree in the fridge, well they seemed perfect for crafting a fall cocktail…it would have been perfect for waiting for goblins to arrive at our door as well as the upcoming Thanksgiving Day festivities in America. When the folks with Atlantico Rum inquired as to whether I would like to try their dark rum…of course I said yes…and I’m so glad that I did! There is something about dark rum I love…and wonder why I so often head for the white/clear version but that is changing. Just opening the bottle of this rum was almost enough; the scent is intoxicating and I knew it was going to be perfect for this cocktail. 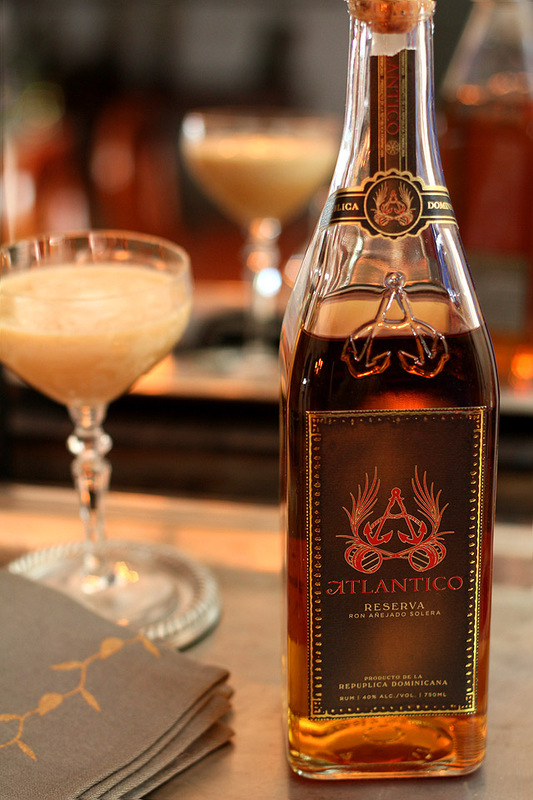 Atlantico is a blend of molasses based rums (heavier style) and fresh cane juiced rums (lighter style) from the Dominican Republic. The molasses gives the rum more body and richness, with the cane juice providing lighter, more delicate tones. It’s aging process however is unique in the rum production world. The molasses and cane juice rums are aged separately for 2-3 years but are then blended together for a further 2 years. Once finished, it is placed into a solera aging system for up to 15 years. For a proper solera aging process, barrels of rum of different ages are stacked on top of each other, the oldest on the bottom, and the youngest on the top. When it is time to bottle, only a small percentage of the bottom (the oldest) barrels’ volume will be used. The empty space created by this drawing-off will be filled with rum from the level above, and those barrels will be filled with the level above them, and onwards and upwards, while the barrels on the top-level will be topped up with new rum. Before bottling, a small amount of Aguardiente (commonly known as fire water) is added to the blend to give it a unique tasting profile. Once bottled, the founders personally inspect, hand number and initial each bottle before shipping. The whole process from start to finish is done by hand; even the bottle and labeling are beautiful. I can not lie; this is my new favorite rum! I received a bottle of their Reserva and the scent was a good indicator of what was to come. Bold vanilla aromas on the nose with a light sweetness; perfect for my foray into pumpkin! I’m funny about pumpkin, well, if funny is that I don’t go nuts over it each fall. I like a good pumpkin pie with the best of them…on Thanksgiving day. Still, my senses do not crave pumpkin in every form imaginable so I thought it fitting that my homage to the ‘Great Pumpkin’ come in the form of a cocktail. It was a risk I won’t deny but I really loved this. Everything was subtle and that’s how I like it. Not too strong with rum, not too sweet and just the right touch of pumpkin. That bit of cinnamon on top sealed the deal; this is a sure winner for fall; everyone loved it! Fill cocktail shaker with ice; add all ingredients except spices to shaker. I’ll be there next Thursday for cocktail hour, right? Looks amazing. Your photos are gorgeous! We just did our own version of a pumpkin martini, with vodka and creme de cacao instead of rum. Great idea to add cinnamon! And love the glass. Thank you Laura; I actually tried it as my homage to pumpkin but with fingers firmly crossed; actually liked it way more than I thought I would! The glass is a story in itself. When I need a couple glass for a Manhattan months ago, I called the manager of my favorite local restaurant; they didn’t have any but he thought he had some stored that had been his grandmother’s. The rest is history, well, except for the part that he actually let me keep the glasses; each time I use it I’m reminded not only of how pretty it is but of Scott’s generosity. You have and always will have exquisite taste. This sounds awesome! I should try to do a cocktail a week too… it’s a fun idea especially if you don’t know a whole lot about different cocktails, brands, and how to use liquors. I’m always looking for a new dark rum, and I love your use of pumpkin and spices for a sweet treat. Thanks so much! Okay, a version of this drink with rum (especially a complex, rich, dark one) sounds absolutely amazing. The cocktail looks delicious, but I am also seriously coveting those gorgeous glasses. So pretty! It was really delicious. The glasses..there is quite a story there Kare. I shared how I came to have them in this post..a seriously generous move on the part of someone else. Yes…love that you can comment again! Truth? I was about as nervous about this as anything I’ve made. Pumpkin? But it was so good…funny how that goes sometimes isn’t it? Gorgeous cocktail, I love the cinnamon sprinkle on top! Thanks for noticing…I opted to not rim the glass and it just needed something and that was the exact something it needed! It is really good…the first whiff when I opened the bottle told me so. Let me know if you do and in a pinch…use whatever rum you have. A reader made it with white rum and loved it too. This is certainly a new and unique cocktail. Only you would think to put pumpkin pie filling in with some excellent looking and sounding rum to make a luscious martini! This is why we love you and your Friday Cocktails Barb. You are so sweet…sometimes I get an idea and you know what…I’m the one most surprised with how much I like it! I’ve seen other recipes, my big thing was to make a simple syrup using brown sugar instead of granulated and instead of mixing in the spices; floating them on top…just cause it looked cool! Thanks Paula. Love your site, thanks for all the great recipes and advice!! Why yes I do…though I sometimes get real turkeys and I’m not talking about one that starts with Wild! In all honesty…pricy making a cocktail and having to buy $40 of booze each week so they keep this effort alive. Downside? I really don’t drink that much; just the cocktail I make for the post unless I’m having a couple of friends join me. I need to have a HUGE cocktail party. There are bottles of booze everywhere; my daughter came over and said, ‘Mom, you know if someone came into your kitchen and didn’t know you did a cocktail a week, well, they might think you have a problem.’ Oops…I better find storage, the bar is jammed full up and she’s right; I’m putting then everywhere! Come on over…I’ll share! I tried this tonight, and although I didn’t buy the rum that was used (I used Cruzan Vanilla) I can tell you this was fantastic. My husband and I will be serving this at our Thanksgiving dinner. Yum! You know I’m delighted that you loved it; I was determined but my mind was a bit iffy until I tasted it…I actually loved it way more than I thought I would. The most pleasant surprise.Thanks Jessie. I’m quite sure I’ve never had a cocktail with pumpkin pie filling in it. But man, does it ever sound delicious! How very creative. You must come visit one day…seems I have a whole list of cocktails I now need to make for you! This sounds incredible! Can’t wait to try it!!! Absolutely beautiful photos! Thanks so much Carol; you must let me know if you do. Everything is very subtle and it’s not sugary sweet. Perfect for me! Sounds delicious, a pumpkin cocktail never would have thought of that. Lovely! A reader bought the ingredients today and made one tonight and loved it…I LOVE that. I was curious but not completely swayed myself even so was just delighted that I actually liked it! So happy to see the gorgeous photos! Somehow, for as many weeks as you have been photographing cocktails, your photos are always exciting and new– really fantastic. I have a pumpkin that I plan on roasting and making a puree out of today. if I am lucky the puree will find its way into this drink! Someone who saw it today make it tonight…always glad to hear that someone loved something I was happy with…and so did her hubs! I need your phone number; wanted to ask you a question today but don’t think I have it! I think I got my own answer; we’ll see how what I decided to do turns out! Dark rum is terrific stuff. 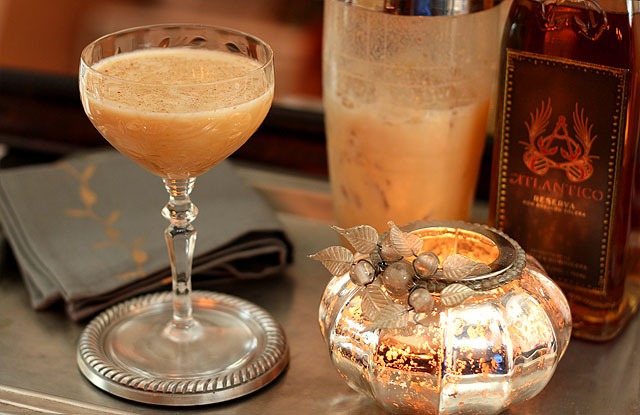 Anything spicy goes with it, so this Pumpkin Pie Cocktail is a natural. Good stuff – thanks. Thank you! I appreciate your visiting and always kind comments. Pumpkin pie anything and Im sold! This sounds amazing!! Maybe dangerously delicious! You hit the nail on the head Jayne…if not for that little buggar called ‘work’ I could have managed more than one easily. You had me at the mere mention of “Pumpkin” – this sounds fantastic 🙂 Will have to check out their rum! This sounds great but I so miss your beautiful photograph! ok, I’m actually commenting on a drink post. 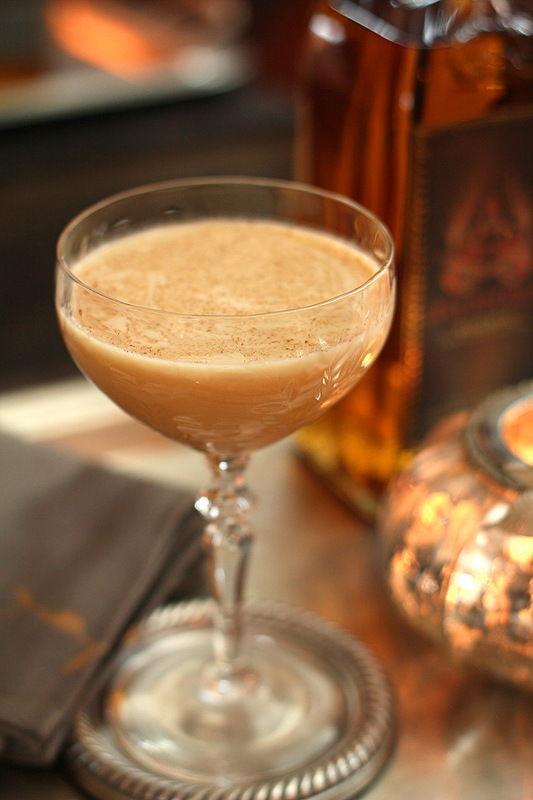 Last night we had a big client appreciation party at our office and the crowd went wild over the pumpkin pie martini’s. Even I, the die hard wine drinker had to give them a try. Fabulous. I must give this version a try and I’ll probably be posting the version from last night. This might be my favorite cocktail. I can’t wait to see your recipe…I took a gamble and I was the one most surprised at how good it was…can’t wait to see yours. BTW…yes, I took photos. But, no I forgot to re-schedule this post for later after I had to time to put them in this morning. Oops. All fixed!